Need more info? View our Motocross Grips buyer's guides. Forget the mess and embrace the simplicity of lock-on motocross grips. Couldn't be simpler, super comfort from the pattern, and throttle cams match nearly all bikes. Limited pattern options, you might be out of luck if you are a die hard full waffle guy/gal. There’s only a few points of contact between the rider and the bike and they make a big difference in how the bike feels. The grips are one of the most important contact points for me. When the grips are too harsh, I feel like I am holding directly onto the metal bars and my hands will hurt for a day or so after. But if the grips are not designed with enough durability then you’ll find yourself having to buy new grips every other ride. 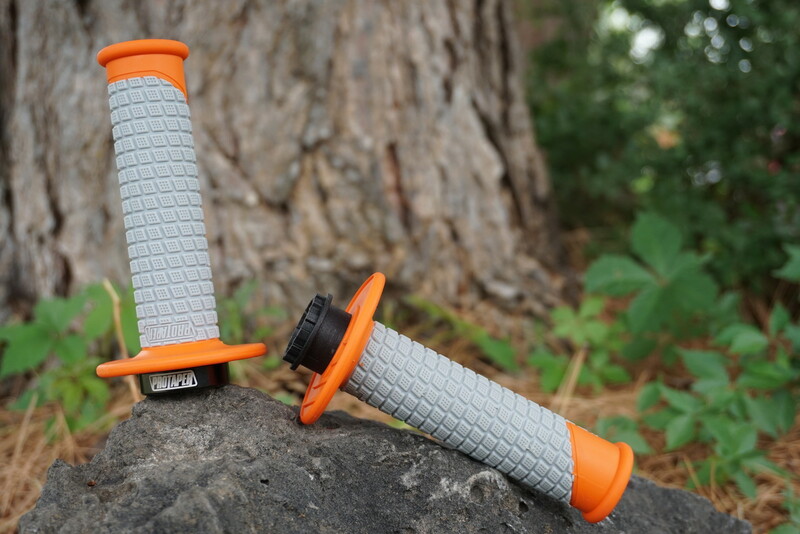 ProTaper has not only adopted this concept from mountain biking and some moto lock-on grips but they’ve perfected it. ProTaper has always had a rad package game, making the product the main focal point and allowing the customer to see the grip before unboxing and install. The grips come in a plethora of colorways and the pillow top grip design has always been a personal favorite of mine as it hasn’t left my hands torn up and I still get that good positive contact feel on the bars. ProTaper also has included a unique widowed core design that allows the grip to feel identical as a traditional slip on style grip without the hassle of install. The install proved to be as simple as possible. The package comes with seven different throttle cams so that you don’t have to worry about fitment for your throttle housing and assembly. With the lock-ons, the days of glue, hairspray or spray paint are gone - these are, hands down, the most simple set of grips to put on your bike! Moving forward I will only be running the lock on style grips because of the ease of install, application variety, and fit while putting in time on the bike. It’s a pet peeve of mine when grips wear out too quickly and oftentimes this is what has kept me from using some of the great feeling softer composites that other brands offer. I know my stock grips last the longest but they have been so harsh as to even leaving my hands bruised after a long weekend of riding. The Pro-Taper set of grips here, seem to have a great balance of wear and feel. My hands have not felt any bruising or even bleeding from riding while the grips themselves have held up throughout a handful of long ride days now too. There are minor signs of wear on the interior area of where my thumb rubs but for the most part the area where I hold on with my hands has remained intact. The only gripe is that I wish these lock on grips had a few additional grip designs available since the two that are offered wouldn’t personally be my first choice (I’ve always preferred waffle patterned grips). With the ease of installation, great feel while riding and so far, great durability I don’t doubt running these grips in the future again. I am a huge fan of lock on grips, I use ODI but gave the PT half waffle a try. They are really thin. It's not a bad thing for those who like the thinner feel, but it's just not for me. I used them for 3 ride hours and decided to take them off. I will probably try the pillow top lock on to see if there's a difference in density, but the last time I used pillow top, they were glued on and didn't last very long. Good on PT for moving forward with product changes. Like I said, I'm not knocking it, it just wasn't for me.